01-Jun-2002 -- Took taxi, driven by local driver Miroslav, from Feodosia to Grushevka, 34 km, 7 dollars, bike in luggage compartment. Cycled 2 km south towards Sudak. Left bicycle in the forest, well hidden, about 1.45 km from confluence. Walked through forest, along dirt road and across fields with dead apple trees and many, many orchids. Power line with parallel dirt road 200 m from confluence. 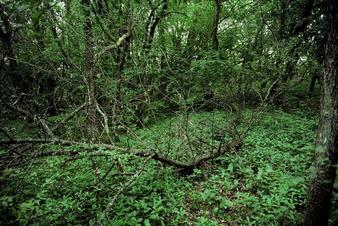 The exact location was found to be in a thick forest 50 m from an apple plantation. Time about 18:45. Took a series of pictures on a slide film, that has to be developed in Switzerland. Cycled home, fist uphill 300 m, the downhill in 30 - 35 km/h speed in increasing darkness downhill to Feodosia. Home at 21:40. Two days later, June 3rd, I got a tick on my leg and had to visit the hospital in Feodosia to remove it. The Russian word for tick is kliech, which in Russian is spelled with four letters, starting with a k. I recalled that there had been white signs with green text along the Grushevka - Sudak road, with text in Russian, the last word being four letters, starting with k. On June 13th I got a message from my friend Peter, still in Feodosia, who had cycled the Sudak - Grushevka road to check what may be a terrific possibility. Yes, the signs read, translated to English: Forest has encephalite-bearing tick. Therefore the apple tree fields were abandoned, and therefore now cows or people in the area. So this confluence is guarded by nature to discourage visits. I now await the incubation time of 10 - 14 days to see if I get the disease. Aug 28 notice: I didn't get the encephalitis.